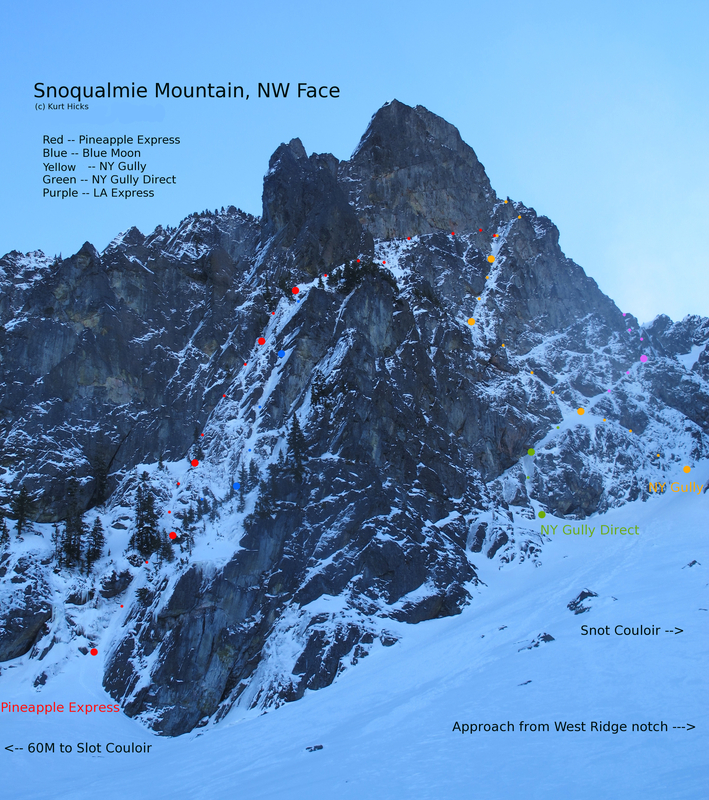 I’ve spent a good bit of time this winter climbing and skiing on and under the NW Face (often mistakenly called the North Face) of Snoqualmie Mountain at Snoqualmie Pass. Here is a photo topo of the current routes on the face – – from left to right: Pineapple Express, Blue Moon, New York Gully Direct, New York Gully, and LA Express. I’ll do a traditional topo sometime soon. Click on the photo for the full sized version. The easiest approach to the NW Face of Snoqualmie utilizes the Phantom Slide approach. This approach is aptly named, being a avalanche path, so time your ascent based on avalanche conditions. Part at the groomer lot of Alpental–this is on the left about 200′ past the main parking lot with the footbridge. Walk up the south facing hill on your right towards the Alpental waterfalls. Once at the base of the waterfalls, veer left into the woods for about 100′ and then go straight up through two steep snowed up cliff bands (there is often ski or bootpack here). After about 300′ of elevation gain, move back to the right to the edge of the Phantom Slide path (be wary of avalanche conditions) and climb straight up to about 4900′. 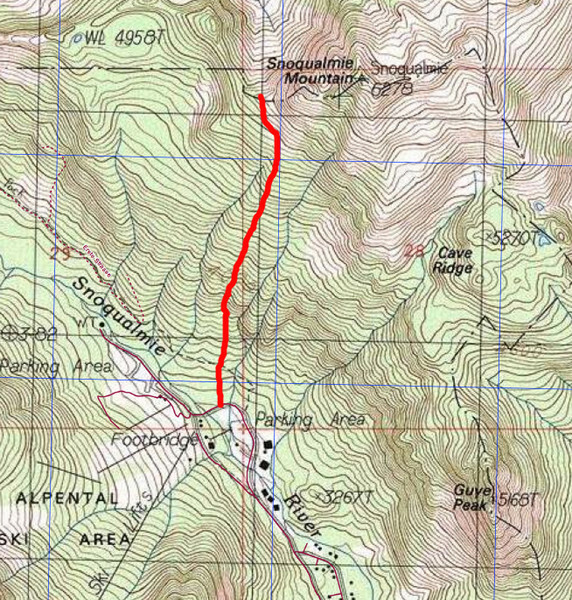 Then continue leftward and up into a lower angled clearing that leads to a notch in the West Ridge at about 5200′. (1-2 hours to here depending on conditions). From the notch, downclimb a couple hundred feet in the obvious gully (~45 degrees) to the north into Thunder Creek cirque. This section can be corniced and wind loaded. Once at the bottom, traverse across to the route of your choice. Approach times depend on conditions, but can be as little as 2 hours total.